James Harnett, a sophomore and Foggy Bottom and West End Advisory Neighborhood Commissioner, spoke in favor of lowering the D.C. voting age to 16 at an ANC meeting Wednesday. A local neighborhood advisory group voted on several measures addressing community concerns during a monthly meeting Wednesday. The Foggy Bottom and West End Advisory Neighborhood Commission passed a resolution supporting a bike route through GW’s campus and discussed community grievances about the impact of installing bike lanes. The commission also passed a resolution supporting a D.C. Council bill to lower the D.C. voting age to 16. The commission passed a resolution in a 5-2 vote supporting the District Department of Transportation’s initiative to create a north-south bike route on 20th, 21st or 22nd Street connecting Dupont Circle to the National Mall. The resolution asks DDOT to remove 22nd Street from consideration and focus on choosing to install bike lanes on either 20th or 21st Street. 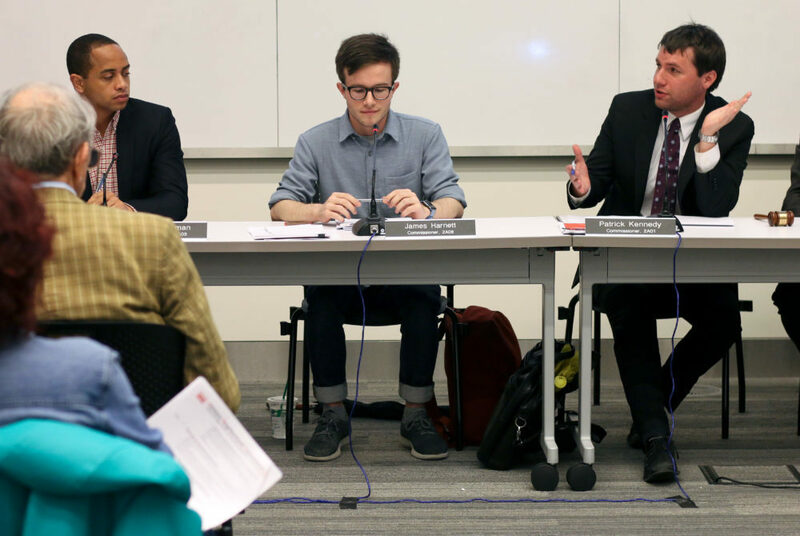 Commissioner Patrick Kennedy said the ANC heard a “substantial” number of community complaints about a bike lane on 22nd Street for various reasons, including issues with residential parking and the worsening of traffic congestion. “Others and I would associate myself in particular with the last category, just feel it is an inferior facility for cyclists,” Kennedy said. Community members disagreed over the use of 21st Street as part of the proposed bike route because it is used frequently for residential parking and bus routes. They said the lane would cause traffic congestion and become dangerous for those using the road. “The population of our residential buildings greatly exceeds the number of people who are going to be serviced by making this accomodation,” Sara Maddux, the West End Citizens Association secretary and treasurer, said. Commissioners failed to pass an amendment removing 21st Street from the resolution and asking DDOT to focus on installing bikes lanes on only 20th Street by a vote of 2-3 with two abstentions. The commission passed a resolution in a 5-2 vote in support of a D.C. Council bill that will lower the D.C. voting age to 16. Commissioner and sophomore James Harnett, who drafted the resolution, said in an interview that the “fundamental narrative” that 16-year-olds are too young to actively participate in government has changed because of recent youth activism, especially regarding topics like gun violence. “If we allow 16-year-olds to vote and do it in a supportive classroom setting where we can integrate their voting habits into the curriculum and into engaging in government, I think that will set a lot more people up for success to continue voting in the future,” he said. Commissioner Florence Harmon, who voted against the resolution, said 16-year-olds do not have the “life experience” to make informed votes on issues that come before the D.C. Council. “You kind of need that experience to get away from home a little bit and kind of be on your own and get invested and develop your own views on things,” she said. The commission heard a presentation in favor of Initiative 77, an act to mandate that tipped workers in D.C. receive the same standard hourly rates as nontipped workers. D.C. residents will vote on the contentious ballot measure in June. Candace Cunningham, a representative of the One Fair Wage Campaign, which assists workers through wage and discrimination claims, said laws require restaurant owners to ensure that employees make minimum wage through a combination of a base wage and tips, but wage theft remains a common practice. “It’s very difficult to plan your life when you are working shift to shift and when you’re depending on the whims of season and the attitude of a customer,” she said. The Save Our Tip organization – which opposes the initiative – did not attend the meeting to speak against the proposal. The organization has repeatedly said that data shows the current system allows workers to bring in a “significantly higher income” than they would with an hourly wage. The commission unanimously passed a motion opposing the Georgetown Inn West End Hotel’s application for a restaurant license. The application requests licensing for an outdoor dining space with “occasional” live music from 7 a.m. to 2 a.m. on weekdays and 7 a.m. to 3 a.m. on weekends. Nayan Patel, the hotel’s owner, said that the late hours are “for flexibility” when hosting events. “We really want the support of the community, and we want nothing like a nightclub in this place,” he said. Commissioners said they cannot support the application because the hours of the outdoor dining space do not follow the community standard of closing at 11 p.m. on weeknights and 12 a.m. on weekends. Patel said he would consider changing the hours of operation to address community concerns.